One September, after writing about ospreys on Cape Cod for years, David Gessner impulsively decided to follow the birds on their annual migration. Each fall these graceful raptors, with wingspans of up to six feet, cruise over the eastern United States, then soar over Cuba and winter in South America, returning north with the spring. In 2004, Gessner went along for the ride, traveling illegally into the mountains of Cuba and deep into Venezuela as he competed with the crew of a BBC documentary to be the first to follow the full migration, trailing the birds by car, boat, foot, and plane. He called his favorite osprey Fidel. Soaring with Fidel is about the exhilaration of migration, but it is also a deeper meditation on the nature of human happiness. In describing the thrill of travel, the antics of these swashbuckling birds, and the cast of characters he meets (and drinks with) along the way including scientists, students, tour guides, and an online group of birders Gessner gives us a profound lesson in the importance of following what you love. 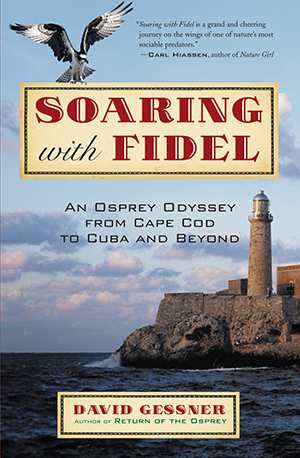 “David Gessner, author of Soaring With Fidel, said, 'There will be a huge hole in the Cape literary community. I have done a brunch for every one of my books and had planned on doing them for each future book. Each time Jack and Bess made it a personal celebration. It was a great way to interact with Cape people, and Cabbages and Kings will be deeply missed.'" Dale Szczeblowski of Porter Square Books recommends: “. . . Because of [Gessner's] storytelling gifts you quickly learn to share his obsession with these hawks of the sea."